Peterson Farm Brings Pigs In A Blanket! Jan Peterson (past director of the Walworth Memorial Library), wanted to bring a special surprise for the children of Walworth. 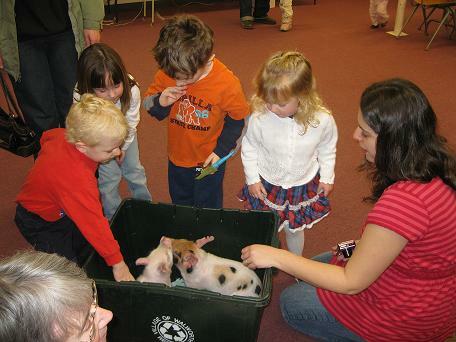 Her sow gave birth and she saw a learning opportunity, thus resulting in a hands on experience for the children. At several weeks old these piglets were a little timid but still lots of fun. Squeals of delight also came from many of the children who attended!